Ask RP Photonics for numerical simulation of the operation of nonlinear frequency conversion devices. Nonlinear frequency conversion works well with ultrashort pulses, because these can have high peak intensities even when the average optical powers are small. However, the useful interaction length in a nonlinear crystal can be limited by the so-called temporal walk-off: as the pulses with different frequencies have different group velocities, they lose their temporal overlap after some propagation distance. This effect limits the conversion efficiency and, if the temporal walk-off within the crystal length is significant, it can also lead to modified pulse shapes. 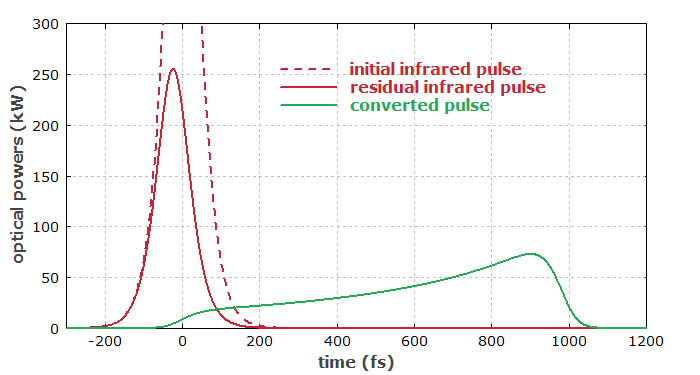 Figure 1: Temporal walk-off for conversion of ultrashort pulses in a frequency doubler, simulated with the software RP ProPulse. In the example case in Figure 1, 100-fs pulses (dashed curve) are sent into a frequency doubler with an overall temporal walk-off of 1 ps. For a low nonlinear conversion efficiency, this would result in a nearly rectangular temporal profile of the second-harmonic pulse, but due to the partial conversion this profile becomes asymmetric (green curve). In other situations, the effect of the group velocity mismatch can be completely different – even pulse compression can occur. For example, there are aperiodically poled nonlinear crystal devices (→ periodic poling) where the temporal walk-off is exploited to achieve certain functions, such as efficient conversion of short pulses, or the splitting into multiple pulses. Temporal walk-off can be very significant even in cases where pulse broadening caused by chromatic dispersion is negligibly weak. This is because dispersive broadening is determined only by group velocity variations within the pulse spectrum, whereas the temporal walk-off is determined by the group velocity mismatch between possibly distant spectral regions. For typical nonlinear crystal materials and wavelength differences of hundreds of nanometers, the group velocity mismatch normally amounts to some tens or hundreds of femtoseconds per millimeter. The total temporal walk-off can thus amount to a few picoseconds within a few centimeters of crystal material. For that reason, femtosecond parametric devices normally use nonlinear crystals with a length of only a few millimeters. The frequency-domain counterpart of temporal walk-off is the effect of limited phase-matching bandwidth. Note that temporal walk-off should not be confused with the totally different phenomenon of spatial walk-off.